William Frederick Cody, “Buffalo Bill,” was born in Le Claire, Iowa in February 26, 1846. While he was still a child, his family moved to Leavenworth, Kansas. Cody left his home in Leavenworth, at the young age of 12, working for a wagon train going to Fort Laramie, Wyoming. Herding cattle and driving a wagon, he crossed Great Plains several times. The year 1859, found Bill rushing to the gold fields of Colorado along with thousands of other prospectors. Searching for gold for two months near Black Hawk, Colorado, he met with little success. On his return to Kansas he stopped in Julesburg, Colorado, where he was recruited to ride in the Pony Express in 1860. 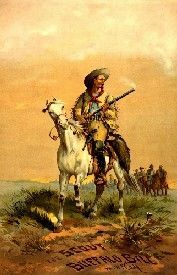 Most of his time with the Pony Express was spent in Kansas, although he occasionally traveled across northeast Colorado. 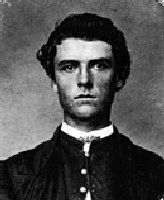 Shortly after the death of his mother in 1863, Cody enlisted in the 7th Kansas Cavalry regiment and fought with them for the rest of the Civil War. After the war, on March 6, 1866, Bill married Louisa Frederici in St. Louis, Missouri and their first child, Arta Lucille, was born the same year. Three more children would follow – Kit Carson, named after the famous frontiersman, in 1870; Orra Maude, in 1872, and Irma Louise in 1883. In 1867, Cody began hunting buffalo for the Kansas Pacific Railroad and soon earned the nickname “Buffalo Bill.” In less than eighteen months, he killed nearly five thousand buffalo, which were consumed by the twelve hundred men employed in track-laying. In 1872, Cody became one of only four civilian scouts to be awarded the Congressional Medal of Honor during the Indian Wars for valor in action. General Philip Sheridan saw in Cody a combination of charisma and frontier know-how. At this time the Army was in need of some good publicity and Sheridan soon arranged for Buffalo Bill to lead lavish hunting expeditions for visiting dignitaries. When the Grand Duke Alexis of Russia came to visit in 1872, Buffalo Bill guided the wagon train, accompanied by General Sheridan and Brevet Major General George Armstrong Custer. 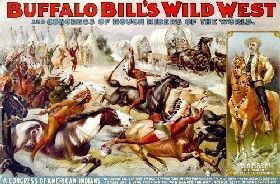 Buffalo Bill was also able to convince a famous Sioux Indian named Spotted Tail and his village to join the hunt. When Buffalo Bill explained to Spotted Tail about the trip, the Indian said, “Great white man wants a big hunt with the Indians.” These excursion became full-scale media events, glamorizing both the military and Buffalo Bill. During this time, authors were avidly romanticizing the exploits of the heroes and villains who roamed the plains and Buffalo Bill Cody was no exception. 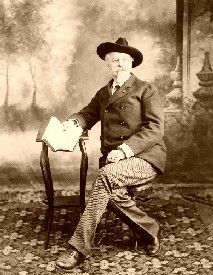 Ned Buntline, who wrote a number of western stories that became known as “dime novels,” further exaggerated and created the hero of > Buffalo Bill. Hungry for news of the West, easterners quickly bought these many books by Buntline and others. In 1872, when Cody was just 26 years old, Buntline persuaded him to take the stage portraying himself, which eventually led to > Buffalo Bill’s Wild West Show. Over the years, the troupe included James Butler “Wild Bill” Hickok, Texas Jack Omohundro, Annie Oakley, several Native Americans, including Sitting Bull, “real” cowboys recruited from the West, and buffalo, as well as other live animals. The Wild West Show would run, in one form or another, for 30 years, charming crowds throughout the United States and Europe. Despite his characterization as a figure from the past, Buffalo Bill always looked to the future. As a businessman, he invested his earnings in an Arizona mine, ranching, coal and oil development, film making, publishing, founded the city of Cody, Wyoming in 1896, and built hotels in both Sheridan and Cody, Wyoming. By the turn of the 20th century, William F. Cody was probably the most famous American in the world. No one symbolized the West for Americans and Europeans better than Buffalo Bill. He was consulted on Western matters by every American president from Ulysses S. Grant to Woodrow Wilson. However, at the same time another show was providing serious competition – Pawnee Bill’s Wild West and Great Far East Show, operated by Gordon “Pawnee Bill” Lillie, who had, years earlier, worked for Buffalo Bill. When Cody’s show began to suffer financially he sold a one-third interest in his production to Pawnee Bill in 1908. Soon, Gordon bought the remaining interest in the show, but retained Buffalo Bill as a partner. The two traveled together as the “Two Bill’s Show” until 1913, when the venture went bankrupt. It was billed as one of the entertainment triumphs of the ages and traveled all over the world entertaining audiences with both realistic and fantasy views of the Old West. The show closed in Denver, Colorado in 1913 after touring for five seasons. Buffalo Bill Cody never retired. He died on January 10, 1917 while visiting his sister’s home in Denver. By his own request, he was buried on Lookout Mountain, west of the Denver, Colorado, overlooking the Great Plains. His wife Louisa was buried next to her husband four years later. All images available for photo prints & editorial downloads HERE.